Navya unveiled prototypes of its robotaxi in Paris. PARIS -- French startup Navya Technologies hopes to beat automotive and tech giants such as General Motors and Alphabet with a robotaxi that will be part of a lineup of autonomous vehicles. The company's 15-seater driverless shuttles have already become a feature in the business district of Paris since July. Now, the company, whose investors include French supplier Valeo, is manufacturing a smaller vehicle to seat six people. It will start selling these for 250,000 euros ($290,000) in about a year. Navya unveiled prototypes of the robotaxi in Paris on Tuesday. Navya is extending its strategy of designing both the vehicles and their software from scratch and in-house, in a bid to bring a finished fully-autonomous vehicle to market faster than a number of rivals. "We are the first to conceive and manufacture a vehicle that is made to be fully autonomous, instead of adapting an existing car," Navya CEO Christophe Sapet said in an interview. "We want to be the first company to offer a full comprehensive lineup of autonomous vehicles." GM has a car-sharing business called Maven and its Cruise Automation unit's tests on autonomous vehicles have helped drive investor expectations that the automaker has two essential ingredients to set up a lucrative robotaxi operation. Waymo, the self-driving car unit of Alphabet, has bet on buying vehicles from Fiat Chrysler Automobiles and implementing its technology into autos manufactured by others. More broadly, venturing into the car business can be a very costly adventure: Dyson, best-known as a manufacturer of vacuum cleaners, is pumping 2 billion pounds ($2.7 billion) into developing an electric car by 2020, which isn't even driverless. The company has 400 engineers dedicated to the project. Navya's means are a fraction of that at Dyson's disposal. 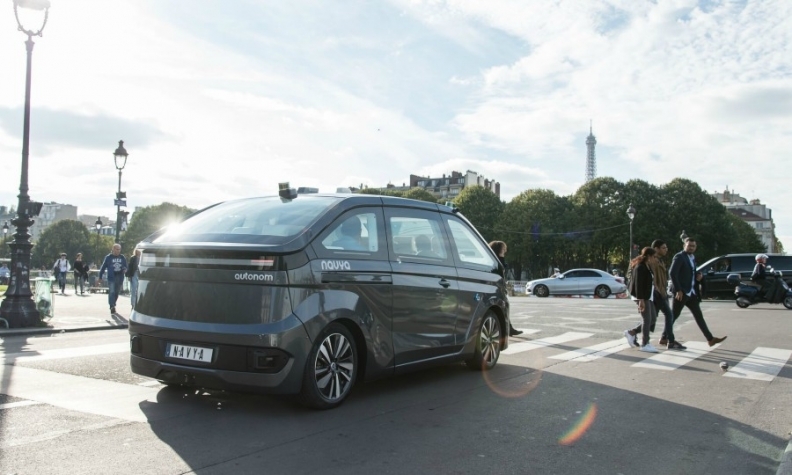 Navya's new cabs, with a top speed of about 80 ph (50 mph), will be tested in the streets of Paris in a few weeks and go on sale in the third quarter of 2018, Sapet said. The first experiments will be conducted with French transport operator Keolis and the Royal Automobile Club of Australia, which in total have pre-ordered about 30 cars, he said. Potential customers range from ride-hailing operators such as Uber Technologies to car rental platforms like Hertz and Avis Budget Group, Sapet said. Tech companies like Apple or even the automakers themselves, such as Renault or Volkswagen Group, are also on Sapet's target list. The challenge for Navya is that many of those potential buyers already have their own plans to develop autonomous vehicles. Separately, experiences from companies including Tesla have shown making the driverless car a reality is complicated. Rival self-driving startup NuTonomy last month was snatched up by supplier Delphi for $450 million. So far Navya's earlier launch into minibus shuttles is on track -- it invested in a production plant in Michigan and set a target to sell 450 units of its bigger minibus shuttles by the end of next year, a third of which in the U.S. -- giving the company some arguments when it pitches to investors. After raising 30 million euros last year from backers including Valeo, the company will need to raise more money to make its latest vehicle, Sapet said.